Submerged in 40-ft.-deep (12 m) tanks of blue, boron-infused water, nearly 50,000 tons of spent nuclear fuel are stored near the 104 nuclear reactors in the U.S. Industry officials say it is perfectly safe to keep there. "You can stand right above a fuel pool" and not get sick, says Tom Kaufman, a spokesman for the Nuclear Energy Institute, which represents the nuclear-power industry. Safe or not, spent-fuel storage will be a significant part of a 90-day review of U.S. nuclear reactors expected to be conducted by the Nuclear Regulatory Commission in coming months. Instigated in the wake of the disaster in Japan, that probe will include an investigation into the ability of U.S. nuclear plants to deal with total power loss and natural disasters. When power to the pumps that flush cooling tanks with water is cut off, the zirconium cladding on hot spent fuel rods can ignite, pumping radiation into the air. Nuclear experts fear that might happen at the Fukushima plant in Japan, and watchdogs say that under similarly catastrophic circumstances, the same thing could happen at U.S. plants. "If we go down that same road, we are likely to reach that same destination," says David Lochbaum, a nuclear engineer at the Union of Concerned Scientists. Storage sites have fail-safes in the event that power is lost, but they're not foolproof. "If the emergency diesel generators are lost  which is the backup power source  the cooling systems for the spent-fuel pools don't have battery capacity," says Lochbaum. "So you have to get either the diesels back or the electrical grid back in order to restore cooling." Rod McCullum, the director of used-fuels programs at the Nuclear Energy Institute, says backup systems in Japan and the U.S. "are highly similar." Though the stakes are significant  the Brookhaven National Laboratory on Long Island, N.Y., estimated in 1997 that a massive calamity at one spent-fuel pool could ultimately lead to 138,000 deaths and contaminate 2,000 sq. mi. (5,200 sq km) of land  government officials insist a worst-case scenario is incredibly unlikely, even in the course of extreme events. "We believe that the spent-fuel pools, these are very robust structures that are designed to withstand the type of natural phenomena that we have seen in Japan," Gregory Jaczko, the Nuclear Regulatory Commission chairman, told C-SPAN on Sunday. There are 31 reactors in the U.S. where spent fuel is stored in "attic" pools above the reactor like those at the Fukushima plant in Japan. 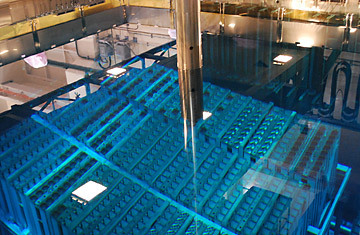 At the other 73 reactors, the spent fuel is stored in tanks housed in buildings adjacent to the operating reactors. Storage tanks are made of steel and reinforced with concrete; all of them are designed to withstand earthquakes that might typically occur within a 200-mile (320 km) radius. Industry critics don't quibble with the claim that the spent-fuel pools themselves would likely survive an earthquake, but worry that it's the power grid and backup generators that are unsafe. Several plants sit near powerful fault lines, including the Diablo Canyon facility near San Luis Obispo in California, and the San Onofre plant about halfway between Los Angeles and San Diego. New York Governor Andrew Cuomo this month ordered a safety review of the Indian Point plant in Westchester County, which sits on the intersection of two faults, just 24 miles (40 km) upriver from New York City. Even without natural disaster, the Union of Concerned Scientists reports that there were 14 nuclear "near misses" at U.S. plants in 2010 alone. Another potential risk comes from terrorist attack. While operating reactors are encased in 4-ft.-thick (1.2 m) concrete cocoons, spent-fuel tanks are housed in more conventional buildings that are conceivably more susceptible to aircraft strikes or explosives. A 2005 Congressional Research Service report weighing just such risks found that a "primary concern is whether terrorists could breach the thick concrete walls of a spent-fuel pool and drain the cooling water." Safety concerns remain even after the fuel is cooled, a process that takes a minimum of five years. Still highly radioactive, cool fuel is stored in steel-reinforced concrete casks that sit out in the open on concrete slabs. There are about 15,000 tons of it currently sitting at nuclear power plants across the country. The casks aren't really supposed to be there. Under a 1987 law, the Department of Energy is tasked with transporting that fuel to a proposed repository at Yucca Mountain in Nevada. But protests from environmentalists, residents of the state and many politicians have delayed the site's opening repeatedly. Without a long-term viable option for fuel storage, industry critics worry the risks will only increase. The coming review from the Nuclear Regulatory Commission is unlikely to put the issue of nuclear safety and spent-fuel pools to rest. Watchdog groups like the Union of Concerned Scientists contend that the similarity between nuclear systems in Japan and the U.S. shows just how vulnerable nuclear plants are to catastrophe. And while nuclear-industry representatives insist that a Fukushima-scale disaster is unlikely in the U.S., they too are watching how Japanese and American officials are responding to the incident. "We are all going to learn something from this," says the Nuclear Energy Institute's McCullum. See TIME's best pictures of 2010.